^^^ Keep in mind that this is all done client side, so what’s happening is all Events are being downloaded to the browser and then being iterated over by the :filter. Hi @gf_wolfer! How did you go about making the calendar responsive? 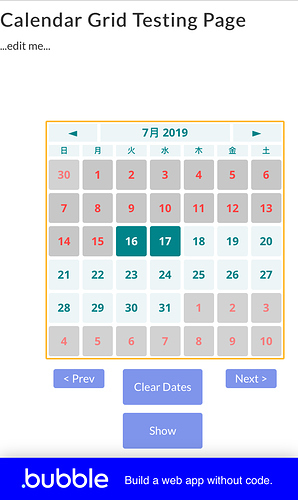 I have a nice calendar in place, with events showing and pretty much all features that the Full Calendar provides but I haven’t been able to make it responsive and not mess up the lay-out of the table. Can you indeed post the steps? Nest a vertical repeating group inside it that just has 1 column and 48 rows. (24hrs. *2=48 half-hour time slots). Does anyone know if this is the best approach or if it can be done? Thanks for the code - but it doesn’t seem to work for months where the first starts on a Sunday (like September 2019 and December 2019). For September 2019 for instance (September 1st 2019).getDay = 0 therefore the loop doesn’t run in stead of running 6 times (as it should to add the August-days before the month starts (eg. 26,27,28,29,30 and 31). getDay = 1 (Monday): the loop doesn’t run - but the month starts on Monday so nothing needs to prepend the days. but for getDay = 0 (Sunday) the loop doesn’t run but needs to prepend 6 days! add an if-case for when getDay evaluates to 0. I carefully read the whole topic and didn’t find a reference to the calendar use once it is built: how do you then display events inside the calendar (how can we place colored stripes that match each event datarange)? @ryan8 do you please have a link to this tutorial you mentioned? 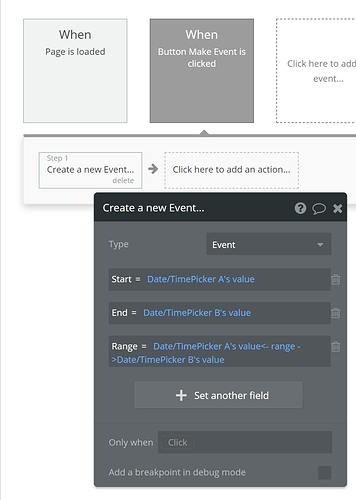 yes i just used Levons (zerocode) tutorial calendar and just added a few more things. This calendar is A-MAZING! Thank you so much!! Quick question: how would I add the functionality to click a button to return to the current date? If it’s March 2019 and I’ve scrolled to December 2019, I’d like to not have to scroll several months to get back to the current date. Thank you!! Just set the state monthOffset to 0. Just wanted to give a on this! Took me 5 minutes to get much better UI with this calendar. Used a small version of the month view to create a customized date picker! This is a great addition to bubble’s resources! Thanks a lot @codurly !!! 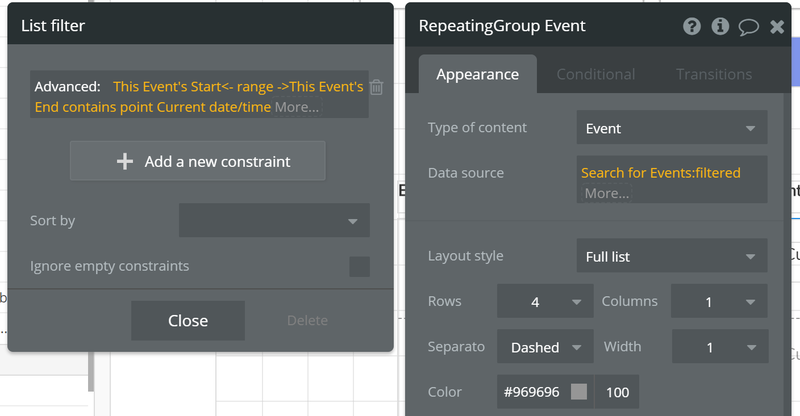 did you have any luck with displaying colored stripes for each event created? Did you ever get a reply back? No I did not. I have not attempted this portion of my app yet either as I expect it to cause me great issues. Best approach for input / output of HTML? How did you create that? Range presentation and picking using the custom-calendar-via-RG technique is actually very difficult to implement (especially if one’s blocked ranges are coming from an API, which can lead to what I’ve called “the API ghetto” problem). Because Bubble makes it difficult to do some types of iteration, it at first appears impossible to build an interactive range-picker in vanilla Bubble (even with Toolbox). But it can be done (see my GRUPZ.com project – https://grupz.com/vacation-rental-booking). The issue is that the only way to build this in Bubble is to make the calendar an insanely complicated state machine. (Rather than telling each “cell” – the dates in the calendar – how they should appear, you literally have to have each cell figure out how it should look based on a couple of dozen conditional evaluations – most of which involve search and/or filter operations.) This becomes very slow, very quickly as there are 42 of these little state machines doing this over and over. And, yet, it loads nearly instantaneously and performance is nearly instantaneous, even on lower-end mobile devices. 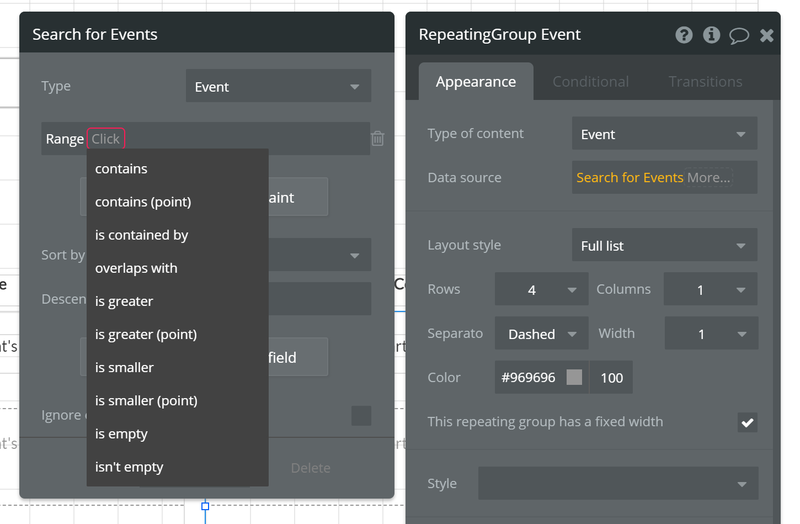 Basically, it’s a specialized type of “repeating group” – designed not to display just ANY sort of list, but to generate, display and work with one very specialized type of list. And it’s designed FOR Bubble programmers BY (arguably the best) Bubble programmer(s)… So its gozintas and gozoutas make sense to the Bubble user. Coming soon as a paid plugin.